At the Red Tower the Walls start again and the trail leaves the side of the road and goes right to join the wall-walk behind the tower. 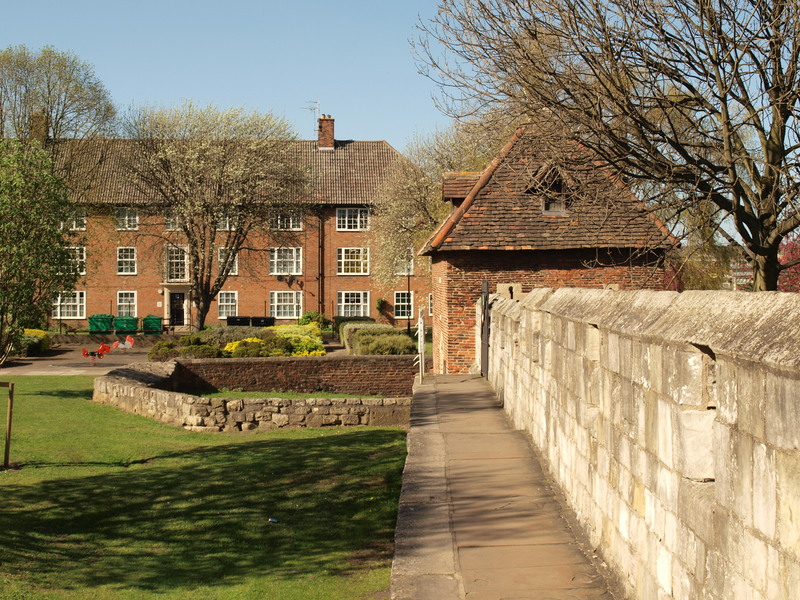 The tower was built of brick at the end of the Middle Ages when money was short in York and the corporation wanted to save money by using cheaper materials. Victorians heavily repaired the ruined tower and built up the land around here [by about 2 metres] so the tower seems much lower than it did when it guarded the large marshy lake that reached up to it. 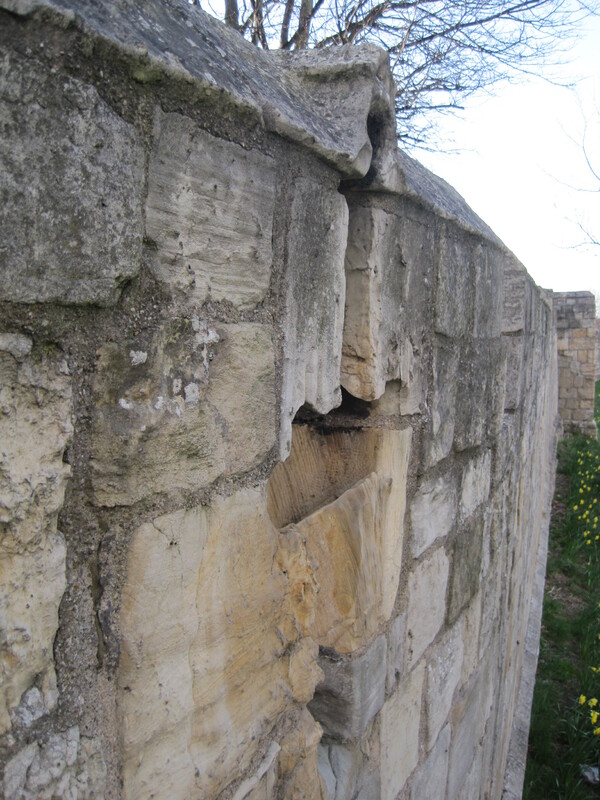 Victorians also repaired the wall-walk and parapet of the Walls here but they noted that some at least of the cross shaped slit windows in the parapet were there before they started repairs. The wall-walk has few railings in this section. On the city side of this part of the trail there is mainly council housing from the mid 20th century because in Victorian times this was an area of very poor housing. However, just after the first interval tower, at the end of the second little road there has been on your right, there is a medieval, towered church; this is St Margaret’s, this can remind you that the Walls were still protecting the old city here. 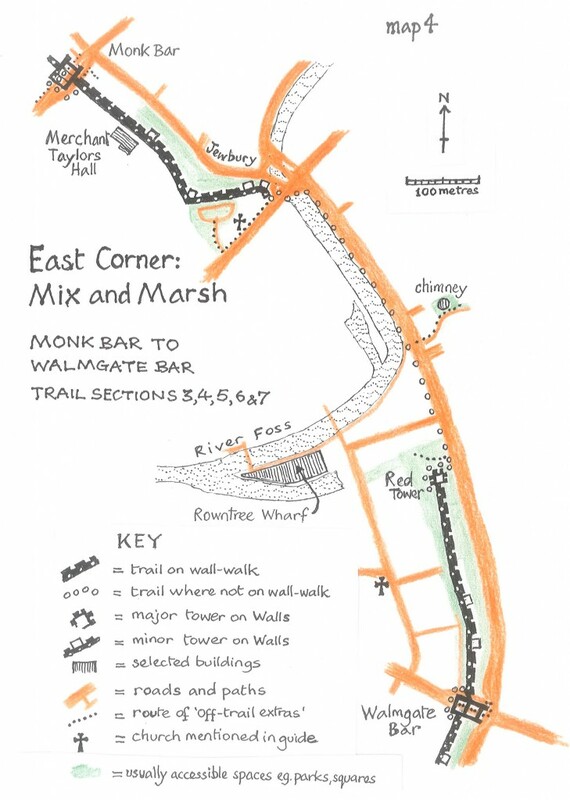 This part ends with Walmgate Bar, and fairly good views of the bar as you approach it, the next section of the trail begins as soon you get to the pavement. 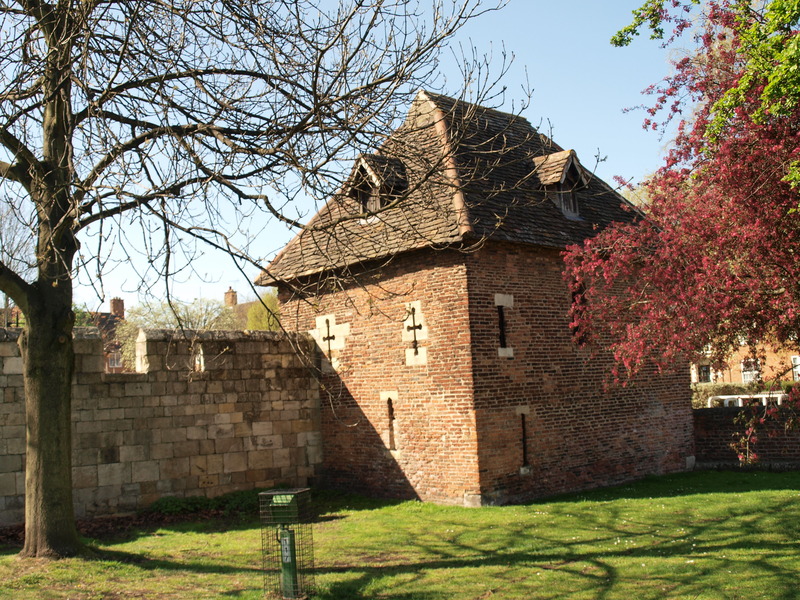 The Red Tower, built around 1500, is the only one in the whole trail to be built of brick rather than large blocks of magnesian limestone cut from quarries about 10 miles away; much of modern York is built on clay so locally made bricks were a much cheaper building material [the story for this part of the Walls tells more of the causes and results of this attempt to save money]. The part of the trail that goes around the tower goes under a “garde-robe” [toilet] that sticks out a little from the wall, but there is no longer the hole that would have allowed human waste to drop down here, apparently straight into the lake. There are 2 boards here about the tower and its history –and one of the metal maps for rubbing [see “Information Boards” section]. The tower is occasionally open but the inside is disappointing, more obviously the result of a Victorian rebuild than the outside. The Walls here protected the newest bit of the walled city, the part that grew up about 800 years ago as a suburb called Walmgate, east of the River Foss on land that was just above the level of the King’s Fishpool. The ramparts here have only had stone walls on them since the mid-14th century. The parapet defending the wall-walk is pierced by a mix of musket loops, cross-shaped arrow slits and simple embrasures. Four hundred years after it was built the wall-walk here seems to have been one of the bits used as a recreational footpath long before the Victorians did their restorations and established the present paved wall-walks on the Walls. This is a good part of the walls for spotting the small brass markers embedded every 25metres along the middle of the wall-walk, the easiest to spot are domed and a centimetre across [every 100metres] others are smaller and flatter, circular or hexagonal –these are simply to help those involved in maintenance to map problems that need attention, spotting them is one of the less rewarding ways of using your time on the Walls but it can be addictive! 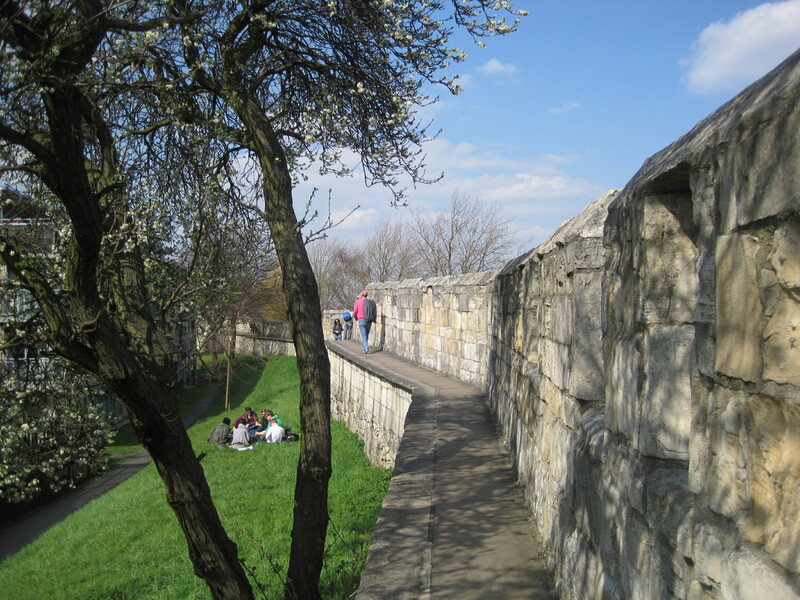 The wall-walk widens into a rectangular interval tower less than 100 metres before Walmgate Bar, where a modern block of flats comes very close to the wall. The battlements of this tower have two cross-shaped arrow slits in the merlons either side of the central embrasure. 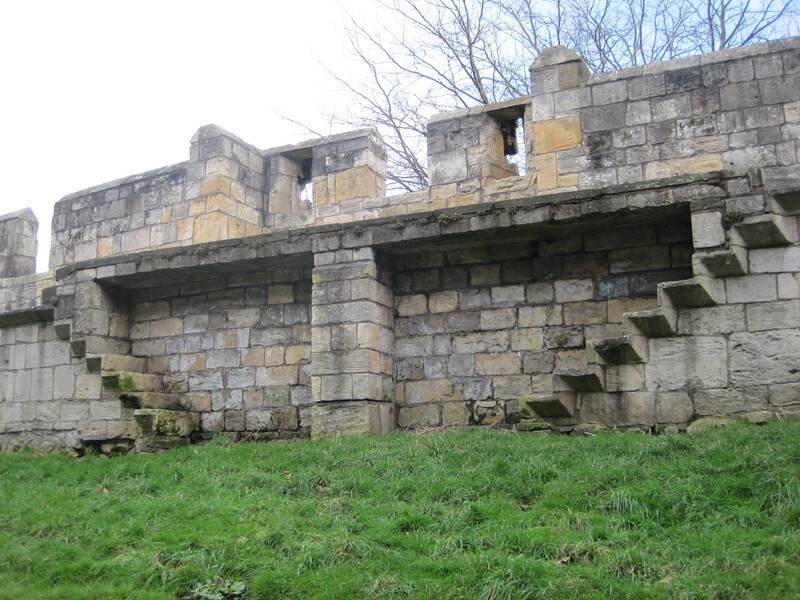 On the outside [not easily seen from the walkway] these arrow slits are crowned by a small stone gable or hood. Most of the cross-shaped arrow slits along this part of the corner have these unusual extras, they were noted before the Victorians did their restorations –but there seem to be more of them now than there were before the restorations. At this tower the wall-walk goes up a step or two, below the paving at this point there are 2 sets of steps going down to the rampart – presumably these steps were once part of the early recreational wall-walk here. The best views from around the Red Tower are of the tower and the Walls beyond it but as you walk along the wall-walk you can pause and look back at features that have already been mentioned as the “basics” of some part of the trail: Rowntree Wharf [the red-brick Victorian warehouse with its battlemented tower], the Destructor [the Victorian incinerator chimney] -and the Minster between them. As mentioned in “basics”, at the end of the second little road to your right you can see a medieval, low towered church, it has large windows of decorated Gothic style; this is St. Margaret’s, it was heavily restored by Victorians and then it became one of the many York churches converted to another use; it is now the National Centre for Early Music, this was an architectural award-winning conversion. Towards the end of the Middle Ages, in the mid15th century, York became less prosperous. Ships were getting bigger and docking at Hull rather than coming up-river to York. 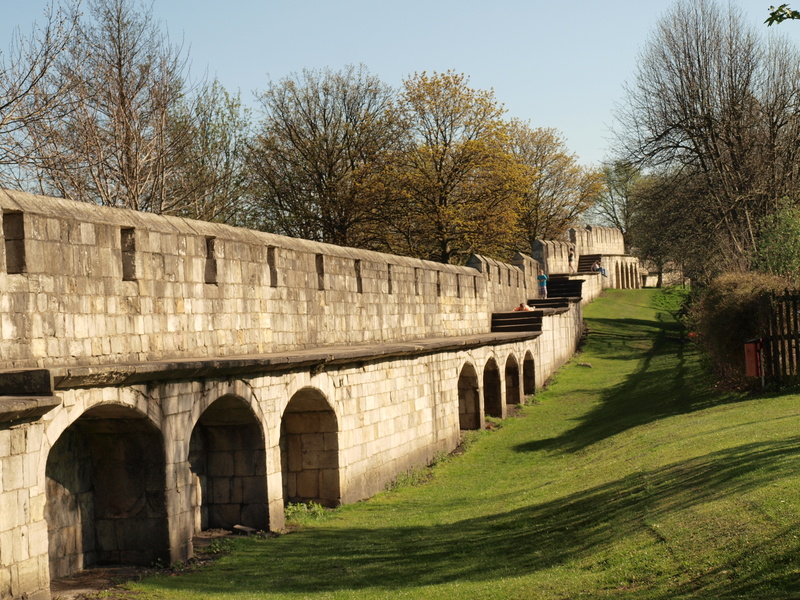 Newer towns like Leeds, where the guilds were less powerful in controlling competition, were taking business away from York –and from time to time there was open fighting over who should be King, fighting that was later called “the Wars of the Roses”. For a while it seemed that York had a friend in the local man crowned as Richard III, he forgave York taxes and had plans to rebuild the castle but then he was killed and his enemy became King. The new King Henry VII was given an expensive royal reception in York in 1486 but he was locally unpopular: in 1487 a rebellion against him made an unsuccessful attack on Bootham Bar, two years later attacks on Fishergate Bar and Walmgate Bar damaged them badly. 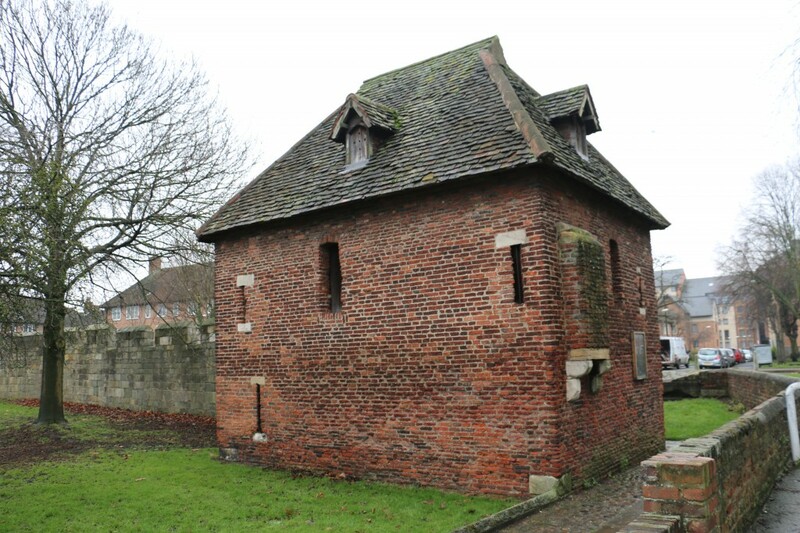 In the 1490s the corporation decided it needed a tower built where the Walls ended south of the great marshy lake –but they decided they couldn’t afford to have it built from stone by members of the masons’ guild [a sort of society of masons who controlled all work with stone in York]. The corporation asked members of the tilers’ guild to build the tower of locally made bricks. Tilers started the work but they soon complained to the corporation that their tools were being broken or stolen. Officials of the masons’ guild were sent for by the corporation and the language they used in their defence got them locked up in prison for the night. Then a tiler was murdered. An official of the masons’ guild [he was the master mason at the minster, the one responsible for the great screen made of statues of the kings of England] was charged with murder. It is said that at first he couldn’t be arrested by the city authorities because he stayed in area controlled by the Archbishop [the Minster still has its own police]. He seemed totally unashamed throughout this conflict, as it is said that while he was in prison he employed a man to shout news of his imprisonment through the streets of York so that all who had business with him should know where to find him. He was not convicted of the murder. The tilers finished the Red Tower but nearly all future work on Walls seems to have been done in stone, by masons. Since 2016 the Red Tower has been “managed” by a local group of volunteers who plan to develop the tower and bring it back into community use. The tower is occasionally open to visitors. The vision for the Red Tower is to bring this historic building to life by offering an inclusive, welcoming space for creative, learning and social activities, run by local people, encouraging local and wider community participation. This will be achieved by creating and curating an ancient magical space that offers a unique oasis in our busy city. The Red Tower Projects vision is to create a multi-use space accessible to local residents, visitors and businesses. It will incorporate meeting and events space, café, kitchen and growing beds, making use of the attractive outdoor space around the building, as well as the two floors of the building itself. 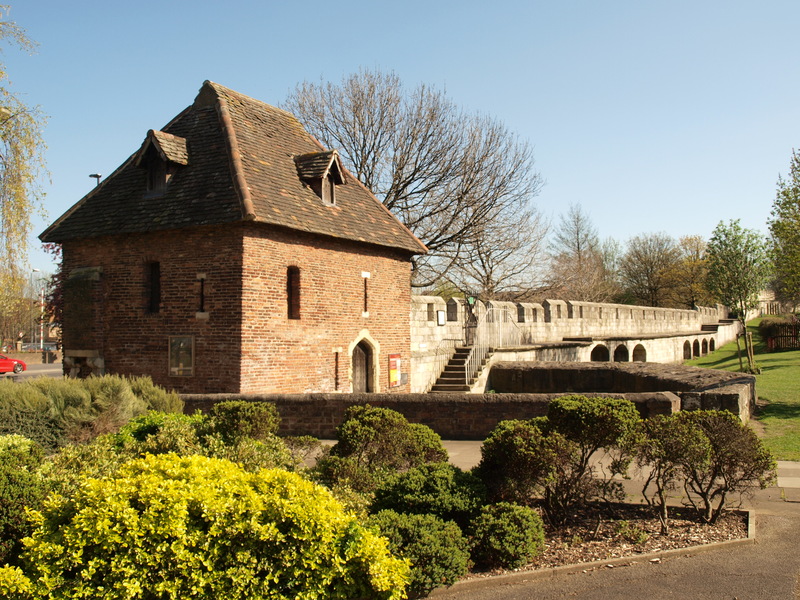 The restoration and re-use of the tower will incorporate a kitchen, cloakroom and stairs which will upgrade the building to serve the needs of a wide range of users. The enterprise will aim to be profitable, with profits used to subsidise community use. Therefore it will be available to low income groups ensuring nobody will be excluded through lack of funds. The Tower will become a safe, open and friendly place which is welcoming to all.